These announcements have been generally well-received, although I have heard some concerns expressed that opening up presumptive provisions across the entire State Service might encourage claims from undeserving workers and create additional unanticipated problems. We are yet to see the detail about how the legislative amendments will work. Hopefully there will be consultation with the consumers and practitioners who work within the system regarding implementation. There are however issues about how our Front-line “First Responder” workers are being treated where they have been accepted by the compensation system. A recent Channel 9 News Article highlighted the issue of a Fire Service employee denied important treatment recommended by his treating doctors despite having suffered a serious injury. While I have no knowledge of the case highlighted above, I have observed in a number of recent cases the adverse effects of an adversarial claims management approach towards Police, Ambulance, Hospital and Fire Service employees who have sustained serious physical and psychological injuries in the course of their front-line work. The most common scenario is that funding for important treatment is denied, usually based on the opinion of an “independent” doctor who spends a relatively brief time assessing the worker. Many of these independent doctors have not practiced in the relevant field of medicine for many years and are reliant for repeat business from insurers according to the value to the insurer of the opinions they express. The insurer (in the case of the State Service – a Self-Insurer) chooses the opinion of that doctor in preference to the opinion of the treatment team who know the worker’s condition best through multiple contacts over a period of time. Lengthy destructive legal processes are necessary to re-instate treatment. If barriers to claims for PTSD by front-line workers are lifted, it will become increasingly important that the systems to support and assist workers managed within the compensation system are reviewed to avoid an increasing number of front-line workers being adversely affected by the system meant to support them. Recently two important National reports have been released relevant to Workers Compensation in Tasmania. The ABS Report – Work-related Injuries Australia July 2017 to June 2018 provides interesting reading about the number of injuries, but highlights the relatively low number of people who actually make claims and have their conditions managed through our workers compensation schemes. While there is no breakdown by state, nationally only 55% of workers who experienced a work-related injury applied for workers compensation. The 2018 National Return to Work Survey provides increasingly useful data about some of the outcomes for injured workers in compensation systems around Australia, including comparison between the states. While the official Return to Work rates around Australia of just over 80% (Tasmania is on a par with other states at 79.3%) are relatively stable, some new information in the current survey is interesting. While Tasmania fares reasonably well on a number of measures, the rates of reported persistent pain and psychological distress are somewhat higher than most other jurisdictions. Some of the Workplace Domain measures for Tasmania were also of concern, perhaps reflecting the relatively greater proportion of smaller employers in Tasmania. I hope to provide a more detailed analysis of these reports from a Tasmanian perspective soon but, irrespective of inter-jurisdictional comparisons, the rates of persistent pain and psychological distress are a cause for concern. Measures to improve the mechanisms to support injured front-line workers are important. This should not only include improved access to compensation system support, but also ensure that compensation schemes do actually support injured workers as intended. I would like diverge from the usual theme of this blog by considering a specific occupational health issue – that of what is still often described as “RSI”. Unfortunately that label is both inaccurate and invokes an emotive response, so I try to avoid its use as much as possible, but the term is difficult to avoid because of its entrenched status, popular usage and lack of a suitable alternative term. I have taken an interest in this subject from the time of the so-called “RSI Epidemic” of the 1980’s. At that time I was the Senior Medical Officer at the Hydro-Electric Commission (now Hydro Tasmania) and that organisation had their share of these problems, although not to the same extent that Telecom (now Telstra) did at the time – as has been described in the literature by Occupational Physician, Dr Bruce Hocking. In my various roles since that time, I regularly encounter the phenomenon of upper limb disorders in computer operators, that, on the face of it, is caused by the sufferer’s work using computers. Particular problems seem to relate to mouse usage, perhaps more so than with keyboard use, although the underlying common factor appears to be the posture adopted at a computer that restrains normal upper limb movement for sustained periods. Similar problems are encountered with musicians and sonographers. Aggravation in association with driving posture is also widely reported. While some sufferers have associated psychological disorders, my overwhelming impression is that the majority of sufferers are “normal”, often hard-working and dedicated people who suffer a convincing syndrome of pain and associated neurological symptoms that is temporally related to their use of computers at work. Chronic pain causing long-term disability from these disorders is common. While there is a relative dearth of objective clinical findings, the presentation is sufficiently convincing in terms of consistency and response to aggravating and relieving factors for me to accept that this probably represents an “organic” condition and is not a primary psychological disorder, fibromyalgia syndrome, hysteria or a socially-caused phenomenon as has been suggested by some commentators. This table would suggest that in the period covered there might have been 4,000 or more cases of upper limb overuse syndrome, comprising 1.3% of claims. If bursitis, tendonitis, epicondylitis and non-traumatic muscle or tendon strain are included the total is potentially much higher i.e. 30,000 or more claims. What I have observed in recent times, is that Comcare, in particular, have challenged continuing compensation for many sufferers of these disorders. It is difficult to know how many claimants accept Comcare’s determination of entitlements and don’t make a legal challenge, but I am aware from reviewing decisions in the AAT and from contact with doctors and solicitors in Canberra and Hobart that the decisions made by the AAT can vary widely with both acceptance and rejection of upper limb disorders claimed as being related to use of computers. One of the important determinants of the outcome is whether there is a specific diagnosis. “However, the plaintiff has failed to persuade me the nature and conditions of her employment constituted a hazard and risk to her health, that is to say a risk of injury, and in particular a risk of sustaining a condition or injury referred to as RSI” . “I am inclined to the view their lack of objectivity has led them, subconsciously at least, to develop a hypothesis to fit their theory that pain syndromes, of the type which the plaintiff claims to suffer, have a neurogenic cause. In reaching this conclusion I have not overlooked Professor Mastaglia’s comments, that the contents of Professor Helme’s paper could be the beginning of objective evidence of an organic basis for this type of pain syndrome” . “My findings do not exclude the possibility of there being a neurogenic factor, to pain syndromes of the type which the plaintiff claims to suffer. Research yet to be done and testing techniques and equipment yet to be devised may reveal the presence of a neurogenic factor or cause”. It would seem that the Tasmanian Workers Compensation Tribunal is having difficulty with decisions on this subject. No decision has been made about a case of upper limb pain related to computer employment where the hearing was conducted in February this year (or maybe the Tribunal is just under resourced). What was previously called “RSI” is currently often described as “non-specific” arm pain. Lack of agreed diagnostic criteria means it is difficult, if not impossible, to accurately explore relationships to workplace factors. On that basis proof to a high degree of scientific certainty about occupational causation for “RSI” has remained elusive. If it were established that there is a specific diagnosable disorder, causative factors can be scientifically examined. When I listen to the evidence delivered by practitioners who deny the possibility that computer work can cause such disorders, there seems to be a heavy reliance on the evidence and opinions from the time of the “RSI Epidemic” rather than referring to up-to-date evidence about the mechanisms of chronic pain or occupational epidemiological studies. Recently I have spent more than 50 hours preparing a literature review related to the above subject. In particular, I looked at literature relevant to the question whether brachial plexus neuropathy (BPN) might constitute a specific diagnosable condition and provide an explanation for many cases of upper limb pain related to computer employment. Dr Jorgen Jepsen in Denmark has done some work that seems to suggest that BPN might be a specific disorder that can be diagnosed reliably by a careful detailed clinical neurological examination, building on the earlier hypothesis of the West Australian Rheumatologist, Dr John Quintner of a neurological basis of “RSI”. The work of Dr Jepsen needs to be replicated by other researchers, but his work does provide evidence of a disorder plausibly related to the postural demands of computer work, worthy of further research. I suspect there is reluctance on the part of many organisations to further explore this subject because of the very significant implications for employers and compensation providers should incontrovertible evidence emerge of a causative relationship between the common upper limb pain syndromes and computer employment. “While the term RSI, which implies an injury which has been caused by physical factors, has long-since been replaced by the term occupational overuse syndrome (OOS), its use, and the negative connotations associated with it, persist. Fortunately, diagnostic criteria have now improved. Workplace injuries and conditions which would previously have been classified as RSI are now more accurately diagnosed. This, along with greater acceptance of the role of psychosocial factors has led to improvements in the management – and the outcomes – of these injuries. I would not accept the conclusions about accurate diagnosis and improved outcomes, at least from my perspective of a practicing physician who regularly sees these cases, the wide variety of diagnostic labels that are applied, the confusion about entitlement to compensation and sometimes poor outcomes. These questions are important to settle, not only from the perspective of responsibility for rehabilitation and compensation where cause-based compensation systems exist, but also from the perspective of evidence-based prevention, in a world where there is growing use of computers and related devices in schools, homes and workplaces. 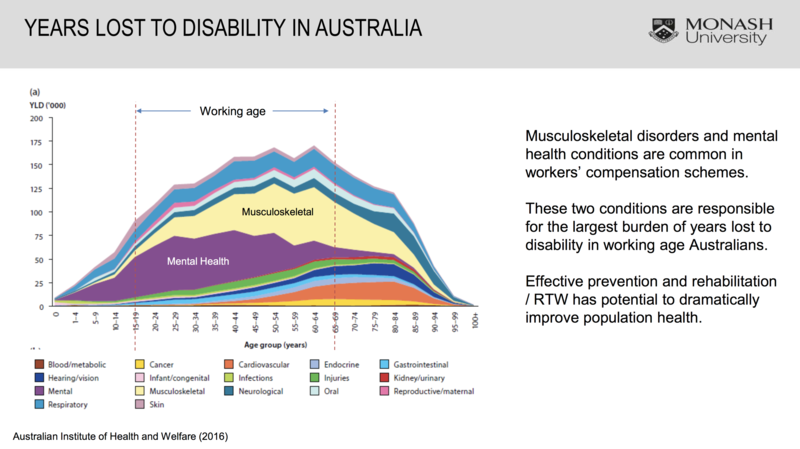 While employers almost universally accept the value of preventative measures to prevent “discomfort” amongst computer operators, elucidation from a scientific perspective of specific medical conditions caused by use of computers and the circumstances in which that can occur can only be of value in prevention of disability, contribute to a productive workforce and ultimately save costs to the community. Occupational Physicians have an important role to play in this area and should take the lead in researching and putting forward the evidence, without fear or favour, to allow informed decisions to be made, both at a system and individual case level. These disorders are clearly the province of occupational medicine, rather than other medical specialities. I THINK THE TIME IS RIGHT TO REVISIT RSI! NO, I DON’T MEAN AIRLINE PILOTS! A patient told me recently that their surgeon had advised that necessary care could not be provided within the workers compensation system. The only option, as far as the surgeon was concerned, was that the recommended surgery be undertaken with funding from private health insurance. Given the necessity for the surgery, the patient felt there was no choice but to proceed on that basis, which they did. No doubt their future management will be complicated, especially if it is confirmed that they do indeed have a work-related condition and rightfully belong within the workers compensation system. This anecdote is but a pixel within the big picture of doctors becoming increasingly reluctant to manage patients within compensation systems. Let’s briefly digress to consider an analogy relevant to patient management within compensation systems. The concept of a “pilot” is a useful one. I picture a ship’s pilot guiding a vessel through treacherous waters with the primary objective of the safety and well-being of the ship. A pilot has specialised knowledge to guide the ship in risky situations. Using this analogy, the injured worker remains as the captain of the ship, but a pilot is needed to negotiate a passage through a dangerous reef or to navigate a difficult harbour to find a safe berth.The prime objective of the pilot is the safety of the ship. Taking the analogy further, the pilot’s objective is not the financial well-being of the system that insures against shipping losses, even though an effective pilot will contribute to the financial well-being of those systems. The health interests of an injured worker and the interests of a compensation system are not completely aligned! Who can most effectively pilot an injured worker within a compensation system? I would suggest the following attributes are important. In my view, the person with the best overall credentials to take on that role is the worker’s medical practitioner. The most fundamental criterion is a durable trusting relationship between the injured worker and the “pilot”. A worker can usually be assured that the doctor’s interests are aligned to their health and recovery interests with minimal conflict of interest, reinforced by the doctor’s legal duty of care to their patients. This “duty of care” is absent for other participants, except to the extent that an employer has a legal duty of care regarding the worker’s employment. With the right to select their own doctor, an injured worker can change to the care of another, if that trust is undermined for any reason. Where a patient’s usual GP cannot take on the piloting role, there should be options for a referral to another medical practitioner with a greater capacity for the role, while retaining the benefits of a trusting relationship through the patient’s input regarding the referral. This can be to another GP or a specialist, such as an occupational physician, with relevant expertise. There are alternatives for the “pilot” role. While in an environment where an employer has a positive relationship with its employees, an employer might be able to take on a piloting role, the sad truth is that many workplaces remain adversarial and employer/employee trust is often the first casualty after a claim for compensation. The advantage that an employer has is knowledge of the workplace issues and the worker’s workplace history, but in some cases a compensation claim is just another step in the deterioration of the already suboptimal employer/employee relationship. While a positive role by the pre-injury employer is essential to a return to work outcome with the original employer, it is the complex cases that require a trusting relationship that continues beyond the loss of the original employee/employer relationship. A worker’s doctor has scope for a continuing relationship irrespective of the situation following injury, along with some knowledge of the worker’s medical and psychological history relevant to understanding the response to injury and incapacity. Another contender for the “pilot” role is the rehabilitation professional. Again, while in many circumstances, an independent and professional practitioner can develop a trusting relationship with the injured worker, there are potential conflicts of loyalty given the mechanism for appointment and funding of rehabilitation professionals. These conflicts have potential to undermine that relationship. The continuation of the relationship is contingent on funding from a third-party i.e. the insurer or the employer itself. If the third party funder interprets a trusting relationship as ‘hand holding’ or advocacy on behalf of the worker, there is the option to terminate the relationship by withdrawal of funding. While union representatives and lawyers can sometime provide guidance on specific legal or employment issues, I do not see there is scope for these people to take on a routine “pilot” role. Indeed, involvement of unions and lawyers is seen by other parties as evidence of a breakdown in the usual workplace and health care relationships and the start of a process that will inevitably lead to a poor outcome. Occupational Physicians (OP’s) are arguably the most important medical specialty in the piloting field, given their expertise in work-related health issues and rehabilitation. In my view OP’s should also play a leading role as mentors and guides to other medical practitioners managing patients in compensation systems with a role in direct management of more complex or potentially poor-prognosis cases. Other important specialties include rehabilitation physicians, pain physicians, psychiatrists, rheumatologists, musculoskeletal / sports physicians and various surgical specialists, particularly orthopaedic surgeons and neurosurgeons, but probably not in a “pilot” role. My concern is that there are barriers to the development of effective piloting provided by doctors because of a diminishing pool of doctors willing and suitably equipped to take on such roles. Discussions I have with GP’s suggests many of them don’t want to take on compensation cases (particularly complex ones) any more. It has become all too hard with a complex poorly understood system, need to constantly seek approvals for treatment, disempowerment caused by the role of the insurer and their medico-legal advisors and relatively poor remuneration considering the complexity and input of time necessary. Despite WorkCover Tasmania’s recent trial of a support and mentoring system for GP’s, known as MAMS, the scheme was abandoned leaving GP’s and specialists without any additional resources to help them manage compensation cases. The inceasing reluctance of doctors to become involved in compensation systems is also reflected in research undertaken in Victoria. I suspect if such research was undertaken locally, there would be the same findings. See link below. Perhaps of even greater concern (certainly to me as an occupational physician) is a developing crisis in the local Tasmanian OP workforce with the impending retirement of 80% of the current workforce that has been in practice since the 1980’s. The 2016 Australian Government Factsheet on the OP workforce provides some sobering statistics. The OP workforce nationally is ageing with well over 50% of practitioners over the age of 60 (myself included)! Tasmania already has amongst the lowest numbers of OP clinicians per 100,000 population (close behind Queensland) as illustrated by the following charts. The situation with an OP shortage is compounded by differential remuneration that preferentially rewards OP’s (and other specialist doctors too) to undertake independent medical assessment (IME) work over actual patient treatment and management i.e. involvement in “pilot” roles. Other medical specialists are also increasingly reluctant to get involved in compensation cases as illustrated by my opening anecdote. With the recent retirement of Hobart’s only rheumatologist willing to take on compensation cases, there are no longer any rheumatologists that seem interested to work in this field. Tasmania’s only rehabilitation physician in private practice advertises on the Tasmanian Health Directory Site: “no workers compensation cases”. Most surgeons I deal with seem reluctant to take on compensation cases. I draw the above conclusion from observing interactions in my local compensation schemes i.e. 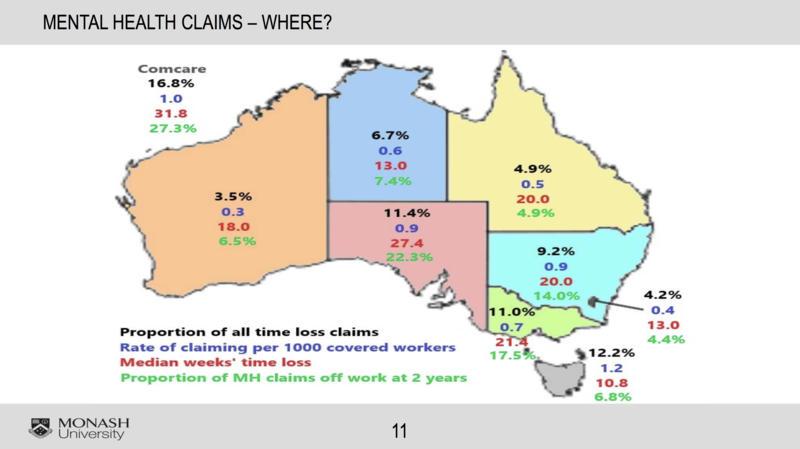 Tasmania’s Workers Compensation Scheme (WorkCover Tasmania) and Motor Accident Scheme (MAIB) and Comcare, but what I do see from interstate jurisdictions suggests that this is a national phenomenon. Formal research confirms this trend. The legal and insurance systems are also recognising lack of GP’s engagement and expressing frustration with slowness in provision of medical information to resolve legal issues. These trends will further challenge our existing compensation systems. See my earlier article Degenerative Disease – Too Heavy a Burden on our Compensation Systems. Already it has been estimated that half the work-related injuries that currently occur are managed outside of the workers compensation systems “designed” for that purpose. There needs to be a fundamental rethink of approaches to successfully engage medical practitioners, both GP’s and specialists, in our compensation systems. Doctors need to be encouraged by a variety of means to develop the skills and relevant career paths, so that there enough “pilots” for our injured workers. This involves both identifying the barriers to engagement and providing incentives and training for those doctors prepared to become involved in this important aspect of medicine – reducing disability following work injury. What is needed is a co-operative effort between various medical organisations, government, regulators and consumer groups to explore these issues and develop strategies to promote GP and specialist involvement in compensation case management. Equally important are strategies to promote the specialty of occupational and environmental medicine in Tasmania so that we have enough OP’s to serve our future needs. There is a clear need from a local training programme for OP’s, before the specialty in Tasmania disappears entirely. I recently had a discussion with Greg McCarthy, until recently, CEO of RTWSA (South Australia’s Workers Compensation Authority). Greg explained to me some of the thinking behind the revamped South Australian workers compensation scheme introduced under his stewardship. While I would accept that it is a political decision to determine the extent of coverage provided by compensation schemes, there is one concept adopted by the current SA model that has relevance to health outcomes. That is the concept of legislated ‘hard’ boundaries. The limits to an insurer’s liability to provide funding can be ‘soft’ or ‘hard’. A ‘hard’ boundary is one where there is little or no scope for challenge. Such boundaries include cut-off dates, whether for period of income support or age restrictions on claimants, and ceilings on amounts payable. The current SA scheme limits income replacement to 2 years. Even the best lawyer can’t argue an entitlement beyond a cut-off date! An example of a ‘soft’ boundary is the provision in Tasmanian Worker’s Compensation Legislation (and most worker’s compensation schemes) to limit liability for psychological injuries. The Tasmanian provisions are intended to save employers from liability where a psychological injury results from a reasonable employment decision. These include psychological injury arising from disciplinary action for poor employee performance or the psychological consequences for an employee missing out on a promotion. In my experience, the reality is that the existance of these psychological injury exclusions leads to an environment where a very high proportion of psychological injury claims in the Tasmanian Scheme are disputed. There is significant ‘collateral’ damage from this provision for workers who have valid claims, but are rejected by the initial claims management processes. Another ‘soft’ boundary is the stipulation that ‘reasonable’ medical expenses are covered by a compensation scheme. There can be protracted and expensive argument about whether some significant medical procedures, such as spinal fusion or neurostimulator implants are reasonable expenses. Sometimes the legal costs of the ensuing argument is more expensive than the procedure itself! At the GP management level, there can be debate or delays in proceeding with relatively routine medical investigations or treatment, causing delay and frustration. The so-called ‘Narrative’ test for Victorian workers to gain access to Common Law (as an alternative to meeting the relatively high WPI criterion for access), is another example of a ‘soft’ boundary that has resulted in a burgeoning video surveillance industry to provide evidence to satisfy the legal system in its attempts to adjudicate on access to Common Law. Although I have not had direct personal experience, I understand that legislated requirements to review work capacity in some Australian Compensation Schemes act as ‘soft’ boundaries. These have resulted in considerable waste of sources to settle the arguments that ensued from these requirements. The negative effects on recovery and the psychological impact from the delay to resolve issues at these ‘soft’ boundaries need to be factored into the equation to optimise scheme design. What might be a best-practice legal process to negotiate a ‘soft’ boundary, through its inherent adversarialism, will result in a direct financial cost, and perhaps more importantly, often cause a delay that will impact of the health and rehabilitation outcome. This can undermine the intention of the scheme to assist recovery and return to work. A ‘hard’ boundary alternative to liability for medical treatment, might be to specify limits to spending on treatment to a $ figure per case or having a blanket exclusion for questionable expensive medical procedures. The debate about what is reasonable is held at a ‘system’ level, rather than being worked at on a ‘case by case’ basis where individual claimants are directly impacted. In my experience talking to patients under my care, the existence of a ‘hard’ boundary can be helpful in highlighting options available to progress treatment and recovery and remove the delay, cost and stress of legal involvement to pursue an uncertain outcome. AN IMPORTANT CONSIDERATION FOR COMPENSATION SCHEME DESIGNERS!